off the trailer. 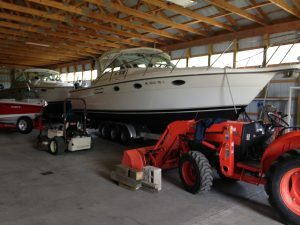 Here is picture of her in the barn just prior to launch. The hull has been cleaned and waxed, the bottom painted and everything made secure before we travled. It seems like every spring the cleaning part gets longer and longer. Trying to get items organized and the inside and topside ready has already taken a lot of man hours. I probably have at least another day before I am done and Memorial day is coming quick. DNR boat inspection is scheduled for Thursday so I have to make sure all the safety equipment is in working order and all current paper work is available. We have done a bunch of these inspections so we are usually ready. Aaron’s younger brother Drew is my new deckhand. Took him fishing Saturday along with my neighbor Dave and caught some lake trout for dinner. We have heard of a couple salmon being caught.